I love that the hardcover design looks like things you’d put in a museum—at least it’s what you’d put in your box of memories. These are the things that I imagine would be put in Penelope Marx’s personal museum—notes, action figures, dinosaurs… (Though I wonder if these items really does have any significance to the story. I hope so!) It’s cute. Especially the light blue background with the polka dots. Unfortunately, the paperback cover pales in comparison to the hardcover. How many covers with hearts on them are out there? Tons. I do like that the hearts are cut out from papers. It’s cute, especially the ones with the jagged cuts, emphasizing the heartbreak. The colors are also lovely together. However, otherwise, totally forgettable cover. I so agree with you. When I saw the cover for the paperback version, I sat here glaring at my computer for a full minute. Like… Why?! 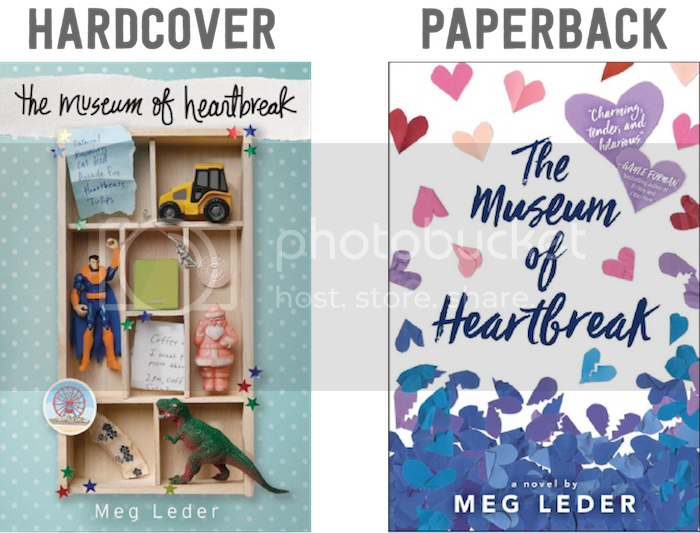 I mean I get that cover changes help books “stand out” or whatever sometimes, but I feel like the hardcover version does a better job standing out–it’s what drew me to the book in the first place, after all! And it’s so quirky and cute, I adore it! But the paperback version? Eh, not so much. That new paperback is really disappointing compared to the hardcover! I totally prefer the hardcover! Like you said, the hardcover really looks like a collection, and I can relate to the “museum” in the title. But the paperback cover just feel too generic and doesn’t give us a glimpse of the story. I love the hardcover image better. I haven’t read this yet,but I was totally drawn to the imagery. If I had only seen the paperback cover I’d probably pass over it.